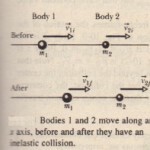 If the total kinetic energy of the system of two colliding bodies is unchanged by the collision, then the kinetic energy of the system is conserved (it is the same before and after the collision). Such a collision is called an elastic collision. In everyday collisions of common bodies, such as two cars or a ball and a bat, some energy is always transferred from kinetic energy to other forms of energy, such as thermal energy or energy of sound. Thus, the kinetic energy of the system is not conserved. Such a collision is called an inelastic collision. A dropped golf ball will lose more of its kinetic energy and will rebound to only 60% of its original height. This collision is noticeably inelastic and cannot be approximated as elastic. If you drop a ball of wet putty onto the floor, it sticks to the floor and does not rebound at all. Because the putty sticks, this collision is called a completely inelastic collision. Shows a more dramatic example of a completely inelastic collision. In such collisions, the bodies always stick together and lose kinetic energy. This is actually another statement of the law of conservation of linear momentum that we first discussed in Section 9-6. In the next two sections we apply this law to some specific collisions, first inelastic and then elastic.